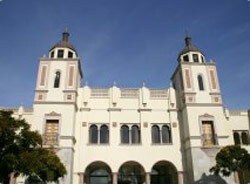 There are a variety of international experiences and opportunities at the University of San Diego. The resources found on this page highlight the various ways in which the University of San Diego embraces its internationalization initiatives. The entities described below all emphasize international activities and outreach. Please follow the links for more detailed descriptions. The Kroc Institute for Peace and Justice (Kroc IPJ) is the bridge between learning and practice within the Kroc School, driving forward its mission to create engaged, applied learning for positive social impact. The core of the Kroc IPJ mission is to co-create learning with its PeaceMakers - learning that is deeply grounded in the lived experience of PeaceMakers around the world, that is made rigorous by its place within a university ecosystem, and that has immediate, practical applications for those working to end cycles of violence. Developing business leaders with a global mindset, the Ahlers Center for International Business at the University of San Diego designs and delivers a wide array of programmatic offerings and experiences for students, faculty and the business community. The Trans-Border Institute is an essential expression of USD's commitment to promote understanding, dialogue and collaboration between Mexico and the United States, and to improve relations between the people and policies of the U.S. and our southern neighbors. The Center for Peace and Commerce (CPC) is a collaborative effort between the School of Business Administration and the Joan B. Kroc School of Peace Studies to prepare new generations of change makers. The CPC encourages students to develop effective solutions to complex environmental and social problems, and to exercise innovative approaches for making a positive impact on the 4 Ps– people, profit, planet and peace. The Romero Center offers service opportunities to all faculty, staff, students, and administrators at the University of San Diego, including meal deliveries to the homebound, lunch preparation at the St. Vincent de Paul soup kitchen, and community service in Tijuana. The Global Center of the School of Leadership and Education Sciences (SOLES) at the University of San Diego, serves to provide students and faculty with information about global education programs and the resources necessary for planning a global education adventure. The Global Center places numerous students in short-term Global Study courses, semester-long Global Student Teaching, Global Exchange and the Global Internship programs. The programs described below all have an international emphasis in program content. Please follow the links for more detailed descriptions. See Programs Offered for a full list of programs available at USD. The Department of Languages & Literatures offers courses in nine languages, with majors in French and Spanish, and minors in French, Spanish, German and Italian. Additional courses are available in Mandarin, Japanese, Ancient Greek and Latin. The major in International Relations is designed to give students a holistic understanding of international affairs, providing a strong background in international relations and comparative government as preparation for careers in the U.S. and abroad as well as graduate study. The graduate curriculum for International Relations focuses on comparative politics and international affairs to give students an advanced understanding of world politics and thereby enhance their career options, particularly in international fields. The Master of Arts in Peace and Justice (2-year program) is an interdisciplinary program designed to prepare students for solving today’s most vexing issues. The programs’ practice based curriculum combines social justice, poverty alleviation and conflict resolution. The Master of Arts in Social Innovation is offered in the Joan B. Kroc School of Peace Studies. Students look critically at the roots of social challenges and injustice, then seek to create real change through bold new responses to poverty, inequality, human rights abuses and humanitarian crises. The IMBA is a full-time, cohort-based program designed to be completed in 16 to 22 months. The structure of the program is flexible, offering students a number of elective options in addition to the traditional business foundation courses. Students in the program have international business experiences on two continents that are organized and supported by the Ahlers Center for International Business. The major in International Business covers a broad range of business skills and knowledge while giving program participants particular expertise in navigating the global business landscape. Offered by the School of Law, this Comparative Law program gives foreign-educated attorneys the opportunity to study law by immersion into a contemporary and dynamic J.D. curriculum, which prepares candidates to deal effectively with U.S. attorneys on questions of common interest. U.S. law school graduates study international law in a dynamic, multi-cultural city that is the world's busiest land and port entry. Candidates from private, public, and government practices study side-by-side with attorneys, judges, and government officials from around the world. A concurrent degree program combines a JD from the University of San Diego's School of Law and an MA in Peace and Justice (MAPJ) from the Kroc School of Peace Studies. International Education Week (IEW) is a joint initiative of the US Department of Education and the US Department of State to recognize the global exchange environment between the United States and other countries. All faculty, students and staff are strongly encouraged to participate in the various activities throughout the week! *Event dates and times are subject to change. Join Middle East specialists, Dr. Avi Spiegel, Professor of Political Ccience, Dr. Ali Gheissari, Professor of History, and Dr. Necla Tschirgi, Professor of Peace Studies as they discuss their work and comment on the current status of international relations in the Middle East. USD faculty and students will exhibit their work in funded international experiences to teach and conduct research in different parts of Africa and Asia. Director Ebony Bailey will discuss the film and its implications. Film will be in Spanish with English sub-titles. This event is open to the public and is co-sponsored by PILAS (Program in Latin American Studies) and the Mulvaney Center for Community, Awareness and Social Action. Learn about the variety of semester and short-term study abroad opportunities for undergradaute students. Pizza will be served! The International Center is hosting a luncheon and panel discussion where a panel of faculty will discuss how they promote international community engagement in their courses - either here (with our local multicultural communities) or abroad (across the border or elsewhere). What are the different ways, across different courses and disciplines, that we can develop ways to engage our students in the local international/multicultural communities? How does a community engagement experience impact faculty and students? How can community engagement be infused into study abroad curriculum? Join us to learn about these questions and more in this interactive panel presentation and discussion. At the luncheon we will also honor all of our 2018 International Impact Award Nominees and announce the final recipient. Join the International Student Organization in celebrating Fall holidays around the world. This student event features an international buffet dinner as well as a DJ and dance-floor. All USD students are welcome. USD University Ministry offers monthly service opportunities in Tijuana as well as week-long immersion programs in Latin America. Please feel free to read more information about these programs. CASA is a program within the Center for Community Service-Learning that engages over 3,000 undergraduate students annually in direct service or advocacy and awareness projects. Students in service promote the community and work for social change. The vision is global, recognizing that we can act in our immediate community, but that opportunities exist for international action as well. All USD faculty, staff and students who are traveling abroad on university business are required to register their trip details. This registration is important as it will help USD be able to reach you in the event of an emergency. STEP ONE: Register your trip. Use the link below to provide your travel information. PLEASE NOTE: The travel registration process is for any INDEPENDENT travel you are doing on behalf of USD (university business). For example: attending a conference, sabbatical, meetings, recruitment, research, consulting, etc. If you are participating in an organized program through the International Center, SOLES Global, Nursing, Kroc School, Ahlers Center for International Business, Law School, SLIC, University Ministry or Community Service Learning, you do not need to register using this site. For organized group programs, your information will be collected through the individual department/area arranging your program. STEP TWO: Print an insurance card. Carry this insurance card with you while traveling.